Would be nice if the G5 decided to have a championship bracket of their own and let the P5 worry about themselves. Nah, that's admitting defeat. I say keep taking the crumbs while stealing a slice once in awhile until things change. ive been saying this for 5 years, a G5 NC game will come long before they expand the P5 playoff. There definitely needs to be a G5 playoff just like the P5 playoff. IMO. Problem with that is we're essentially right back to FCS/1AA. Anything that furthers the P5/G5 divide is not beneficial IMO. And say goodbye to the revenue from this system? No reason to do that. What we should be pushing for is a 12-team play off. First 4 teams (presumably P5 conference champions) get a first round bye. The next 8 teams enter a qualifying round played at each of the higher seeds' houses. The four winners would then face the top four in the quarter finals which could be 4 of the NY6 bowls. The semifinals would be the other 2 NY6 bowls. Then the natty would be it's own game. G5 champ would be guaranteed at least a 12th seed or higher. This. We’d essentially be making a new 1-AA. While that might have worked the first time in the early 80’s when the first split happened, there’s no way it could work now. Ultimately, this would be ideal, but there will have to be some incremental steps, IMO, before this is ever a reality. 6 teams/2 byes, 8 teams, 10 teams w/ byes, etc. 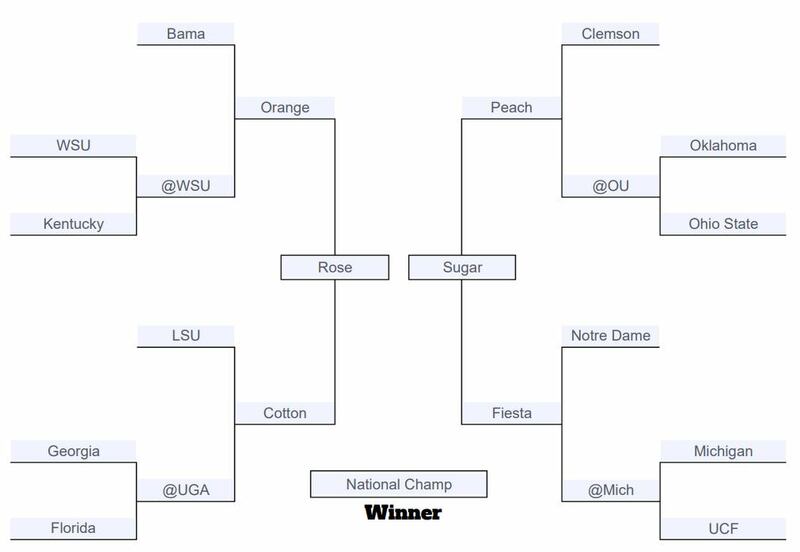 The idea that I've heard in the past that actually makes the most sense is expanding the playoff to 8 teams. All 5 "Power" conference champs are automatically in. The top ranked G5 champ is in. That leaves two at-large bids. What it did is create a ghetto that incentivized moving up as a symbol of institional status. That’s bad for everyone. No one should want another arms race like the one that resulted in former I-AA teams spending FAR more money to escape the ghetto. The NCAA should expand the playoff and guarantee access to G5 programs in some form, as the NCAA does with basketball. I doubt any of us can even imagine college basketball without the Cinderella stories, and those stories are largely the exception that proves the rule. The elites still get what they want in college basketball, and the profits are even bigger than they would be without the Loyolas because Cinderella stories generate more hype. Only one P5 school per season spends its way to the basketball NC, and that would be the case in football as well. Why would Alabama care if their NC path ran through an undefeated UCF team or an SEC team they’d already beaten the regular season? Last edited by pete4256; 31st October 2018 at 02:33 PM. Think about what happens when Boise beats Oklahoma in that format. Non-automatic Qualifier (essentially G5) Conference record in BCS bowls: 5-3.